Immersion, a developer of touch feedback technology, launched the HD Integrator SDK today. This tool allows hardware manufacturers to employ some awesome haptic effects in Android smartphones. I got a chance to try out some of the effects and themes in a hands-on demo earlier this week. The HD Integrator is compatible with the Android 4.0 (Ice Cream Sandwich) user interface as well as its home screen and apps. One of the effects Immersion showed off is called “Ambient Awareness,” which uses metadata to assign a specific feel to important information. For example, while flicking through photos on Facebook, you might feel a heavy sensation when you swipe to indicate a photo with a lot of comments. 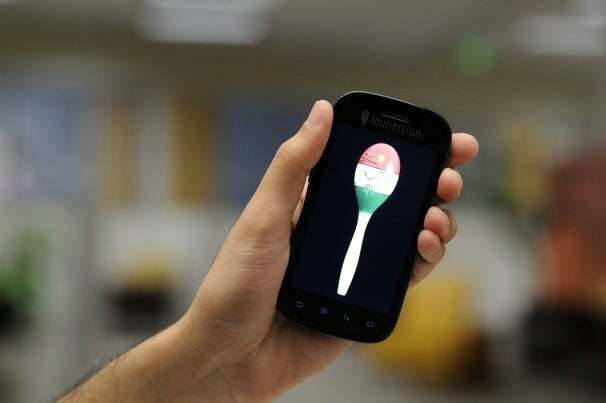 Immersion showed me a few other apps, like a maraca app (pictured above) that made the demo phone feel like it was full of rice. There was another demo app where you roll a ball around the phone’s display. Whenever the ball hit the side of the screen, you feel a sensation on the phone. Depending on how quickly or forcefully you moved your phone, the “ball” felt springy or soft. Basically, it felt like a real ball rolling around inside the phone. Haptic feedback is traditionally used in Android native and third-party keyboards and other buttons. Immersion envisions haptics being used in other scenarios, however, like in an accelerometer or with audio tracks. Last year, Immersion launched its Motiv haptic SDK for Android app developers. Since its release, games like Grand Theft Auto 3, use haptics to make your gaming experience that much more intense. In GTA 3, you feel a rumbling sensation when cars zoom by and jots when you crash. Overall, I was really impressed with how much haptics enhances the Android user experience beyond the gaming scenario. Hopefully, we’ll see a lot more phones this year using this cool technology.